» Bling up your computer life with a gold leaf-covered HDD and memory stick! Bling up your computer life with a gold leaf-covered HDD and memory stick! Add a little shine and sparkle to your computer desk with these gadgets covered with traditional Japanese hand crafted gold leaf. Digital accessory maker I-O DATA, based in Ishikawa Prefecture’s Kanazawa City, recently announced the release of two dazzlingly unique products commemorating the company’s 40th anniversary — a portable hard disk drive and a USB memory stick encased in real gold leaf! Kanazawa, the capital city of Ishikawa Prefecture which is located on the western (Sea of Japan) coast of the central main island, is known for their excellent gold leaf industry and is responsible for over 98 percent of the gold leaf production in Japan. So we have to say it’s perfectly fitting for the people at I-O DATA to decide to adorn their commemorative items with this highly prized local product. Let’s take a closer look at the items they’ve produced in collaboration with Katani Sangyo, another Kanazawa-based company that specializes in gold and other industrial metal leaf manufacturing. ▼ Here’s the portable HDD that can be connected to both USB 3.0 and 2.0 ports. The HDD is compact yet holds up to 1 TB of data, so it’s perfect for storing and carrying around large photo and movie files or backing up your computer data. It can be connected directly to a computer, without an AC adapter or a separate electrical source, and its USB 3.0 capabilities offers processing speed that is 10 times faster than the usual 480 Mbps of a 2.0 interface, while still being USB 2.0 compatible. Plus, you’ll be able to tell what kind of interface you’re connected to, as the power light will turn blue for USB 3.0 and green for USB 2.0. ▼ And here’s the USB memory stick that can be connected not only to computers but Android smartphones and tablets as well. The memory stick holds up to 8 GB of information and has two connectors, one for computers and another for smartphones/tablets, between which you can switch easily with just one click, and it can be used even with devices without microSD card slots like the Nexus 7. It too is USB 3.0 compatible, allowing for speedy transfer of large data files. 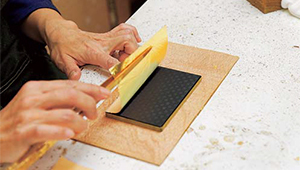 The gold leaf on each product is applied by hand by Kanazawa craftsmen, so you can count on the quality of the finish to be excellent. They’ll be making 1,000 of each item, and both are available on I-O DATA’s online shop ioPLAZA, the HDD for 13,824 yen (US$122.38) and the memory stick for 5,400 yen ($47.81), as well as at select electrical appliance stores. The online shop unfortunately doesn’t ship overseas, but if you do have a chance to buy these items in Japan, they’re sure to make a flashy statement! 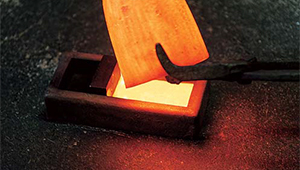 The molded gold alloy is pressed out to a thinness of 0.05–0.06 millimeters (roughly 2/1000 of an inch) using a rolling machine. 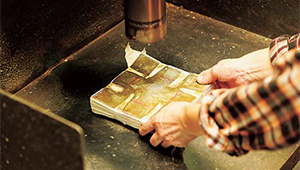 The gold alloy sheet is thinned out further on a special paper called zumi uchi paper on which the gold is beaten and spread to the full size of the paper. 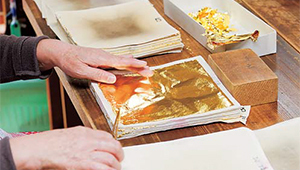 The process is repeated about five times on increasingly large pieces of zumi uchi paper until the gold sheet is roughly a 21 centimeter (8.3 inch) square and a mere 0.001–0.002 millimeters (4/100,000–8/100,000 inches) thick. 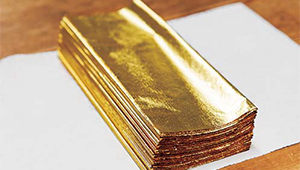 The gold sheets, wrapped in paper and covered with what is called “bag leather”, go through the repeated process of being beaten by a machine for three minutes and cooled for 15 minutes dozens of times until they reach the astounding thinness of 1/10000 millimeters (4/1,000,000 inches). Finally, the gold leaf is carefully applied to all parts of the item, resulting in a unique and elegant looking product. We hope you enjoyed seeing all the glittering gold!